It's no secret that I have far more face masks sitting on my skincare shelf than any one person really needs, but it's one area where I think an abundance of choices is, if not totally justified, then at least acceptable. Plus, the plethora was the inspiration for this fantastic hair trick that I've been loving for the past four or five months. You may have seen clay-based shampoos or scalp masks floating around, but what I love about this method is that it combines two components most of us already have lying around and rejigs them together for a brand new use. It's super simple, gives great results, and only takes a minute or two longer than an ordinary wash! Why put clay in your hair? Much the same way as it does for your face and body, clay applied to your scalp will pull out any oils, dirt, debris, and toxins that have accumulated in the pores and hair follicles. Not only is this clarifying, it also encourages hair growth since blocked hair follicles have been linked to hair loss and thinning hair. Clay also offers soothing properties and a boost of minerals that can help combat an itchy scalp or dandruff. Applied through the actual lengths of the hair, the clay helps to strip away any accumulated hair products or buildup. It doesn't dry out the hair, and it also lends an extra oomph of volume, both at the roots and throughout. Combine one part clay to two parts shampoo in the palm of your hand. Stir together, then lather through scalp and hair as usual. Make sure to really work the mixture into the scalp, then let sit for 1-2 minutes. Rinse out and follow with conditioner, as needed. I've used various clarifying shampoos and homemade apple cider vinegar rinses over the years, but nothing has worked as well as this simple trick! I use this method every third or fourth wash and my hair is healthier and bouncier than it's been in a long time. I don't suggest using a pricey $100 mask in your hair -- save those for your face!! -- but it's a great use for plain clay or simple blends. Different kinds of clay will give slightly different results, so it's definitely worth experimenting with more than one. For ease of use, my favorites have been already hydrated tubes of clay like the ones from Redmond or Chorus Supernatural (they're basically squeeze and go!) but dry clays absolutely work too. For powders, you'll need to wet a small amount before you hop in the shower and then proceed as above. 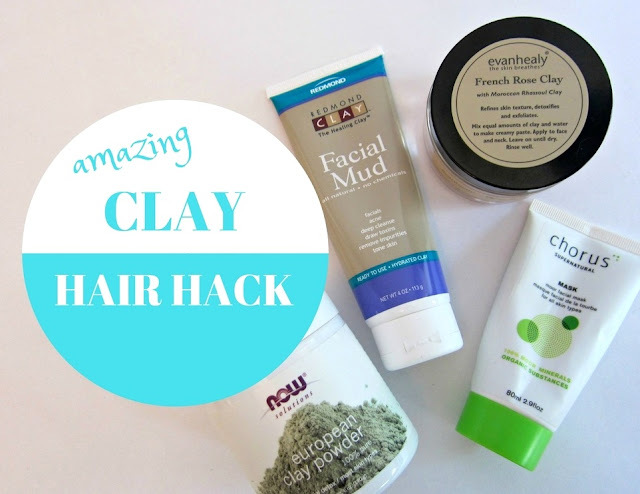 Have you used clay in your hair before? I really like the idea of mixing clay with my shampoo!! I tried making clay mixtures and have tried clay shampoos that ended up being epic fails. Going to give this a go, thanks girl! Thanks Sarah! Not sure why, but I've never quite gotten the hang of baking soda rinses -- glad to hear they work for you though! I've tried using clay in my hair alone but never thought about adding it to my shampoo. What a great idea! Trying it today!